DianeClehane.com: THE ROYAL WATCH: A Day at the Races, Will & Kate's Canada-U.S. Trip Schedule Announced & Pippa: The Next TV Star? THE ROYAL WATCH: A Day at the Races, Will & Kate's Canada-U.S. Trip Schedule Announced & Pippa: The Next TV Star? Don't you just love this picture? Forget about Mr. and Mrs. Wales wanting to be just like the couple next store. I love them at their regal best when they are sleek and chic (Love the top hat and the Stephen Jones fascinator!) and infusing formerly fusty old royal family outings with their own particular brand of modern glamour. Judging from this shot, I'd say Kate is a pretty quick study, wouldn't you? 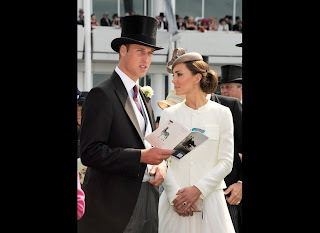 Prince William and Princess Catherine (that Duchess title just doesn't suit her, does it?) pulled out all the sartorial stops when they were on hand this weekend to cheer on Queen Elizabeth's horse, Carlton House, at the Epsom Derby in Surrey, England. The newlyweds certainly lent a touch of glamour to the event, but didn't bring the Queen any luck -- her horse came in third. The afternoon was truly a family affair. Carole and Michael Middleton (who were not invited to sit in the royal box and watched the races from the stands) were also on hand. Turns out Kate's parents had a stake in another horse, Sohraab, who came in fourth in another race. I don't know about you but I can't wait to see what Kate will be wearing for Trooping the Color next Saturday. William and Harry will, of course, be wearing, full ceremonial dress and join the military parades at the all-important occasion. I'm betting the newly minted princess will wear something beautifully tailored and elegant. Diana always wore Catherine Walker for the occasion. It still remains to be seen who will become Catherine's go-to designer for official royal occasions. But as the Brits like to say, style-wise she's "hasn't put a foot wrong" so far -- and seems to get better with every appearance. They will be visiting Ottawa, Montreal and Quebec City in addition to other parts of the region. Their stop in Calgary, Alberta will coincide with the city's celebrated rodeo, the Calgary Stampede. Yeehaw! The newlyweds will also be visiting the Canadian airfield where Catherine's late grandfather, Peter Middleton, was based as an RAF pilot during the second World War. One insider told me Catherine was very close to her grandfather who passed away last year at age 90. "It's going to be emotional for her." The final leg of their trip will be a two-day stop in Los Angeles beginning July 8 which is rumored to include an event with the British Academy of Film and Television or a charity polo match with the proceeds going to one of the many charities patronized by the royal couple. No official confirmations on any of this have been made by Clarence House, but one thing is for sure -- don't look for them to try to catch up with the Kardashians. "This is a working visit," one royal insider told me. "They do not want to be perceived as spending time sipping champagne with celebrities. They are being very, very careful with their public image and they know this trip will be closely watched." Sorry Kim, but you won't get a chance to pump the princess for wedding tips after all. And finally, from the Pippa pipeline comes reports courtesy of The National Enquirer that television divas Barbara Walters and Oprah Winfrey are dueling it out for the chance to sign Pippa Middleton to a television deal. While she is proving to be more than a worthy stand-in for her otherwise engaged sister, I'm fairly certain this will never, ever happen. The Middletons are proving to be very savvy with their public relations strategy which doesn't include doing anything to annoy or overshadow the in-laws. I'm sure the royal family is happy to let Sarah Ferguson (who has a documentary on her attempts at personal redemption permiering on OWN) have the sole spotlight in the states as she continues to humiliate herself at every turn. Stay tuned for more dish on the royals in next week's ROYAL WATCH. Cheerio!